The Ouray Ice Park is the world’s first ice climbing park and host of the Ouray Ice Festival, an annual celebration and competition attracting climbers from across globe. Featuring trekking and climbing expeditions on five continents and ranked as one of the best adventure companies in the world. Dubbed the "Switzerland of America," the town of Ouray is nestled in some of the Rocky Mountains' most rugged peaks. Located in the spectacular Uncompagre Gorge in southwestern Colorado, the Ouray Ice Park is the state's mecca for ice climbers. 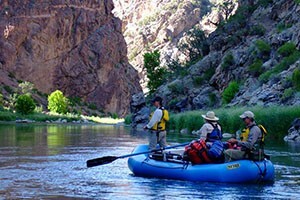 Ouray Mountain Sports serves Ouray Colorado with a full array of sporting goods and expert advice. Skyward Mountaineering's certified mountain guide offers custom rock climbing, ice climbing, skiing, and alpine adventures worldwide. The Ouray Ice Park is the first of its kind in the world and host of an annual festival in early-January. There is no charge to use the park, and all proceeds from festival events go toward the park's operations. The festival also hosts an ice climbing competition that attracts climbers from around the globe. 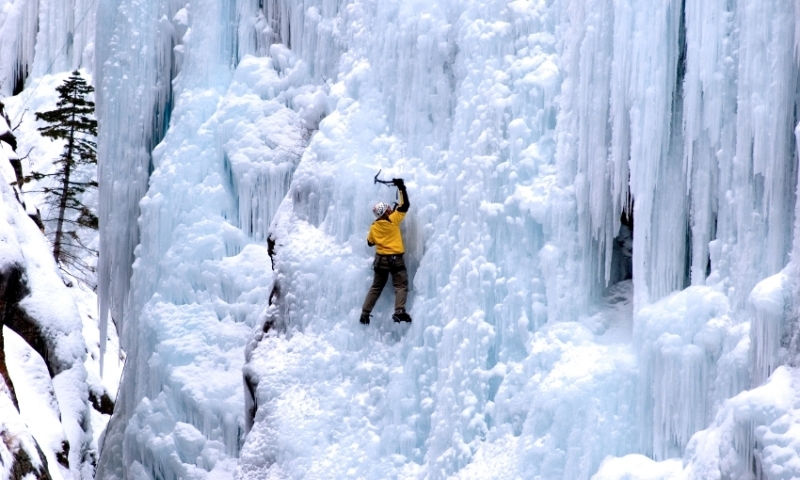 The Ouray Ice Park consists of dozens of 80-to-200-foot waterfalls along a one-mile stretch of the Uncompahgre Gorge with climbing routes scattered the length of the park. Just looking at the series of frozen waterfalls is spectacular, and watching climbers make their way up the vertical ice sheets is an experience. There is no better time to visit the park than during the Ouray Ice Festival, a celebration of all things ice climbing. The Ouray ice climbing park is located at the south end of Ouray along Highway 550. From Telluride, go west on Highway 145 and turn right at the stop sign onto Highway 62. At the next stoplight, turn right onto Highway 550 and look for the park on the switchbacks after passing through Ouray. For more information call (970) 325-4288. The ice park opens in mid-December and can stay open until March depending on how cold the weather is. The annual Ouray climbing festival is held in early January. The park is free to use. Ice Festival auction, slideshow and dinner proceeds are contributed to the operation and maintenance of the ice park. The Ice Festival hosts one of the premier climbing competitions in the country with climbers from all over the world attending. There is also free ice climbing demos and a kids wall.